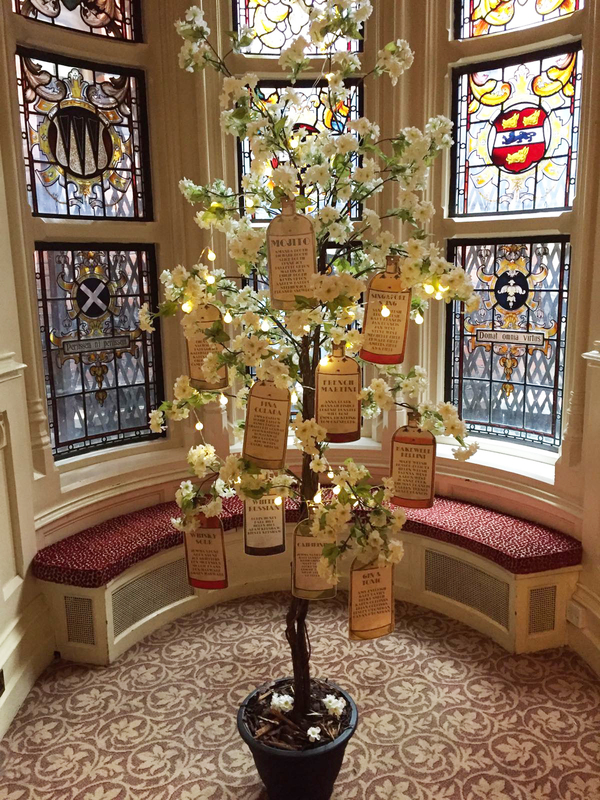 One of our beautiful fairy-lit cherry blossom trees used as a unique table plan by Amanda & Richard at The Elvetham recently. 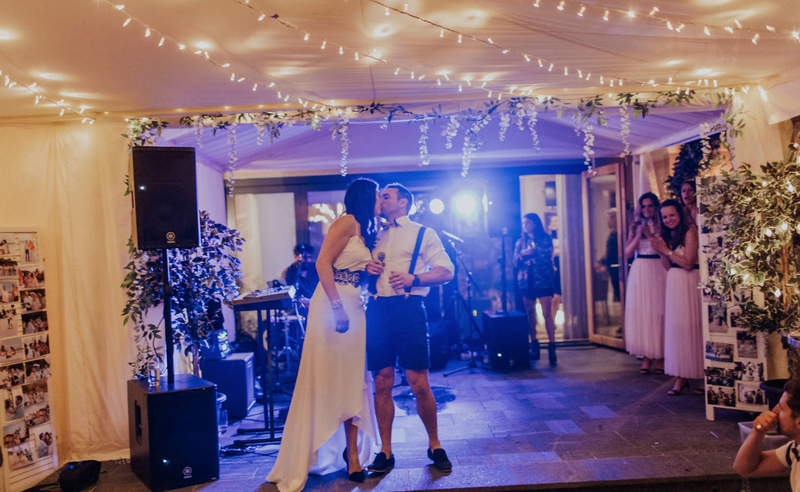 Gorgeous photo of Natalie & Richard celebrating their wedding with UK family and friends – showing off our room divider screens used as photo stands, our fairylit evergreens and fairylit wisteria garlands. 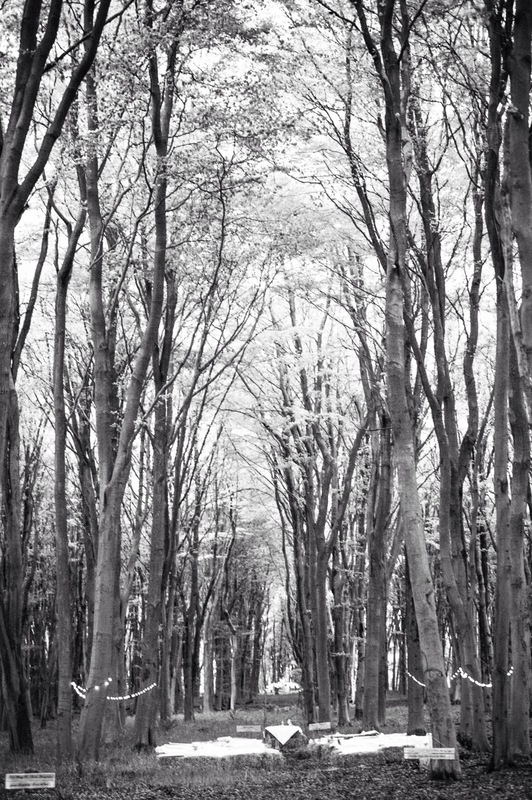 Thanks to Abigail Fahey Photography for this stunning shot. 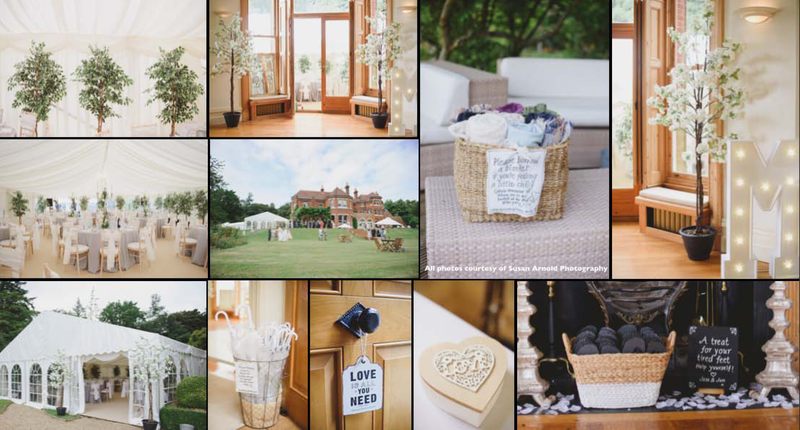 Country House wedding on the Hampshire/Surrey Border where we supplied fairy-lit evergreen trees and cherry blossoms to transform the marquee and house, baskets of snuggly blankets and brollies, flips flops for the tired dancing feet as well as a instamatic camera photobooth and extra touches like the little tin signs and treasures shown above. 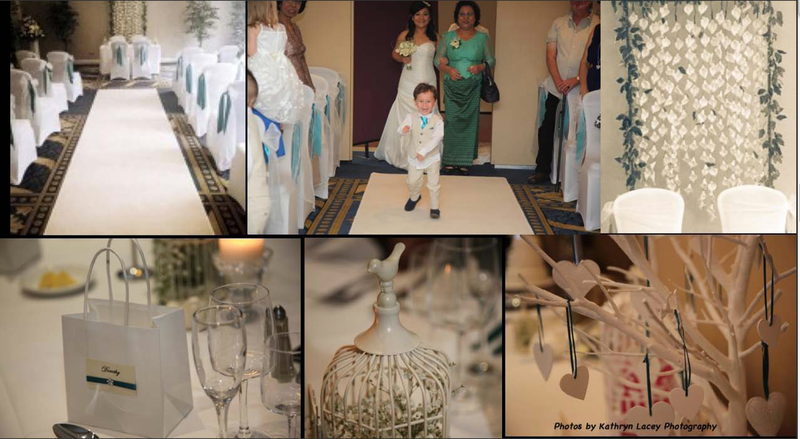 A truly stunning wedding soon to be featured on a top UK wedding blog. Photographed by the extremely talented Susan Arnold Photography. 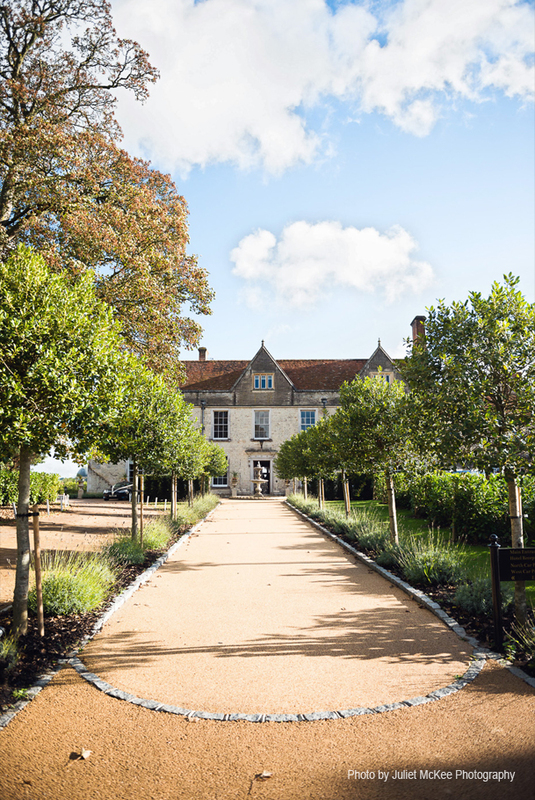 Another beautiful wedding in the same country house above, this time with a more rustic style. 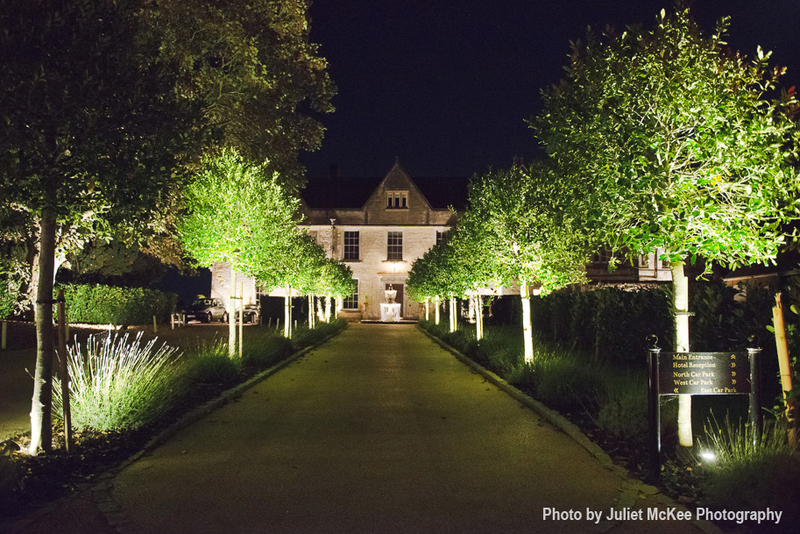 Once again our fairy-lit evergreen and cherry blossom trees transformed the house and marquee, as did the floral archway. 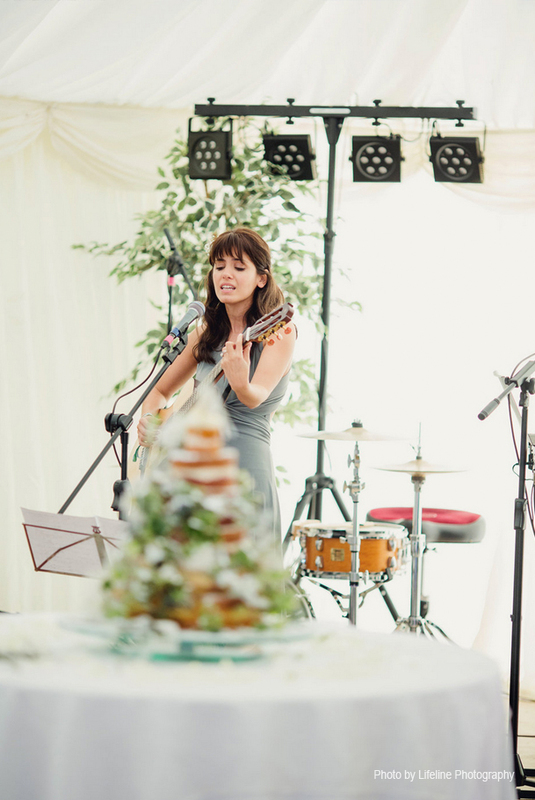 Our sorbet colour lanterns added whimsy alongside the gorgeous chandaliers in the marquee and log slices holding jars of country style flowers added to the rustic feel. 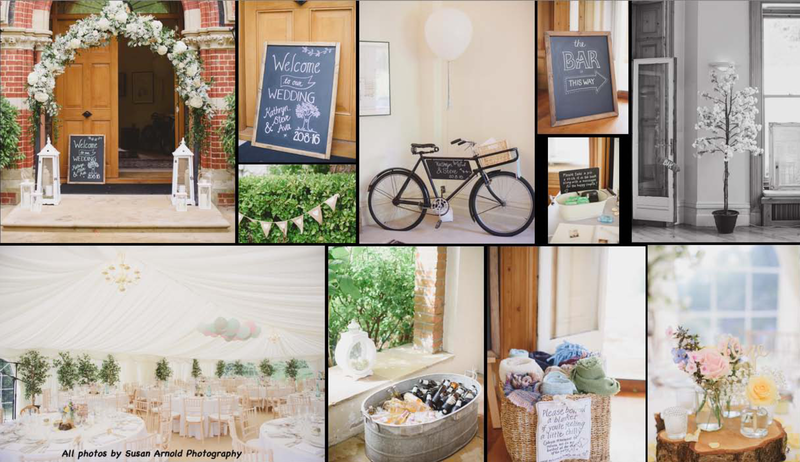 Our vintage butcher’s boy bike was a real hit in the entranceway with a basket to collect cards and gifts and our handwritten chalkboards welcomed and directed the guests. 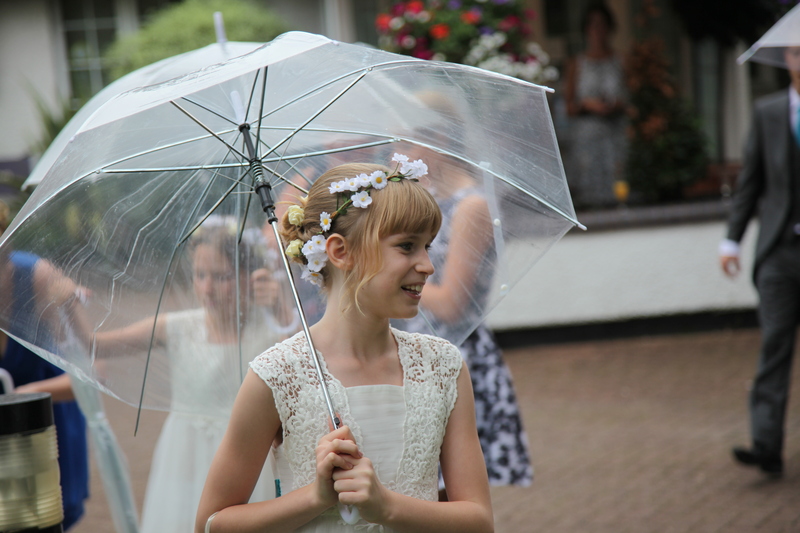 Baskets of brollies came in handy when the unexpected rain came down and made for some lovely bridal party photos. 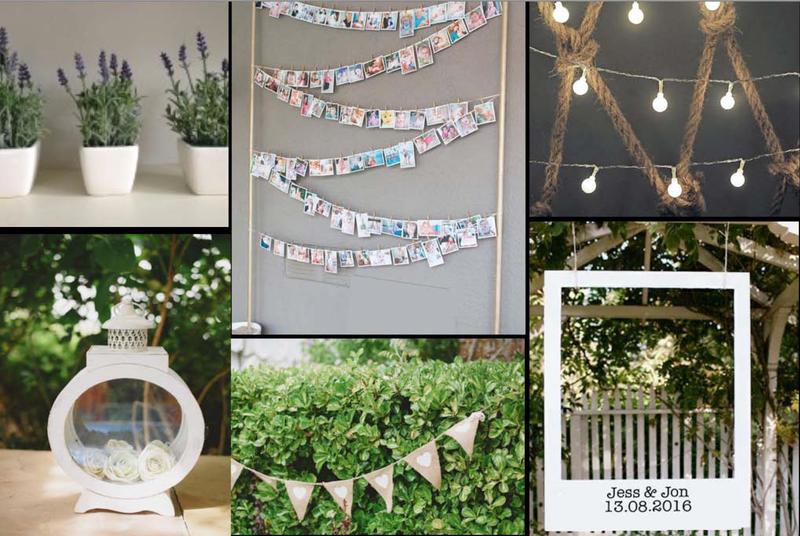 Other touches included hessian bunting, porthole lanterns and an instamatic camera DIY photobooth complete with scrapbook so the guests could paste their pictures alongside a message for the happy couple. 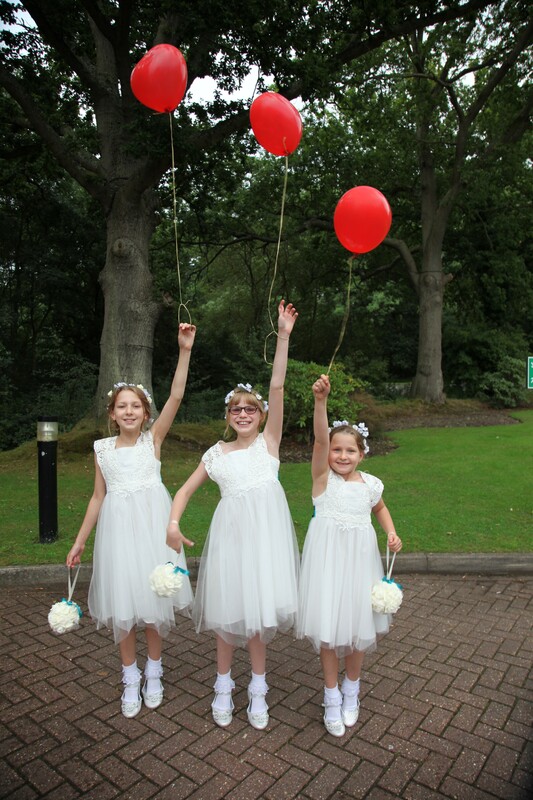 Another extemely lovely wedding! 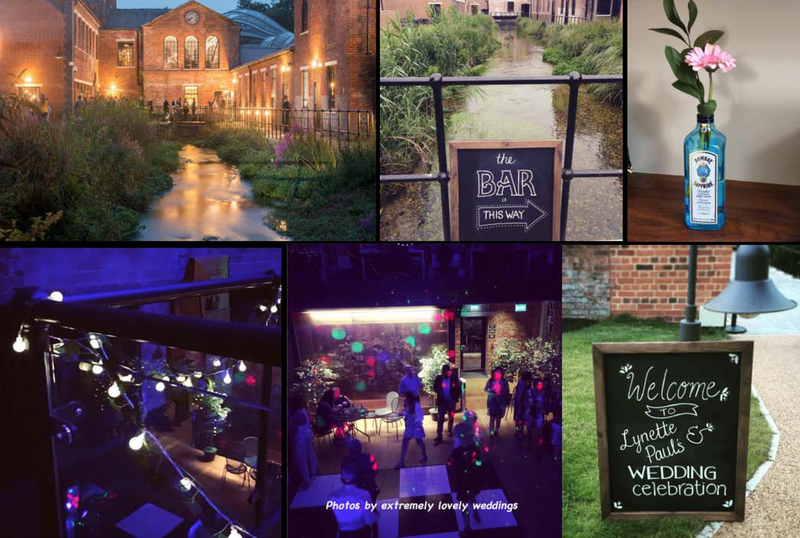 A first for us at The Bombay Sapphire Gin Distillery in Hampshire. 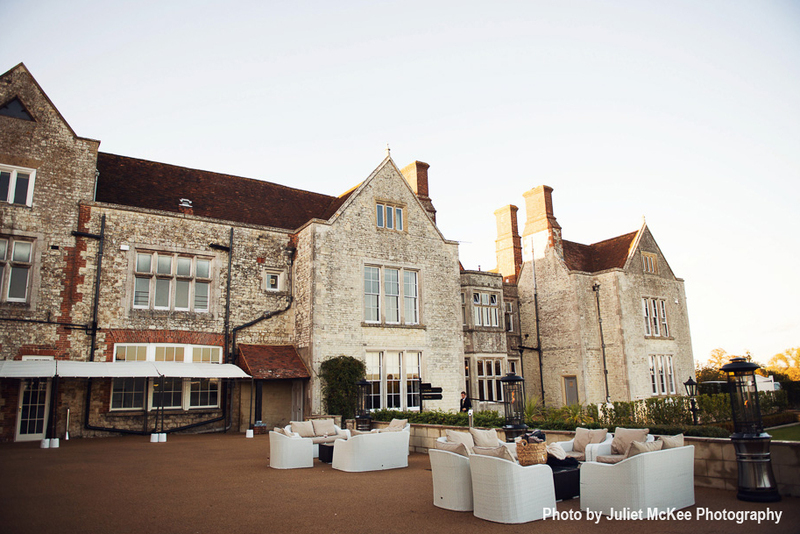 What an amazing venue and really special on a summer’s evening. 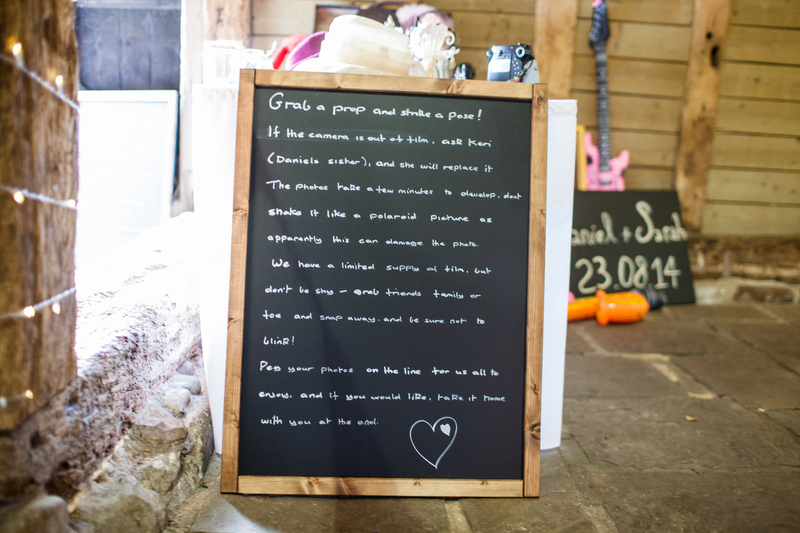 Our fairy-lit evergreen trees and mini-festoon lights transformed the reception area of the distillery so that it was unrecognisable and our couple chose handwritten chalkboards to direct and welcome their guests. Flickering candlelight glass votives (with battery flame because of the alcoholic venue!) added magic to the courtyard outside overlooking the water. 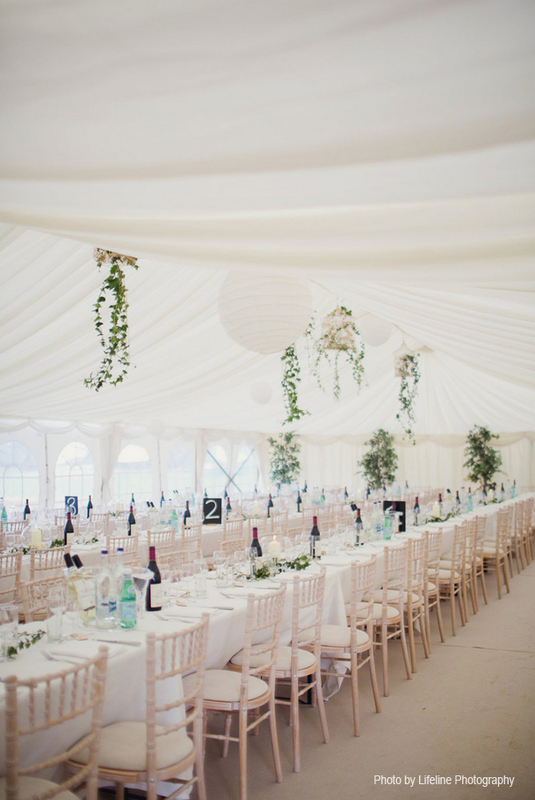 A gorgeous wedding created on a small budget. 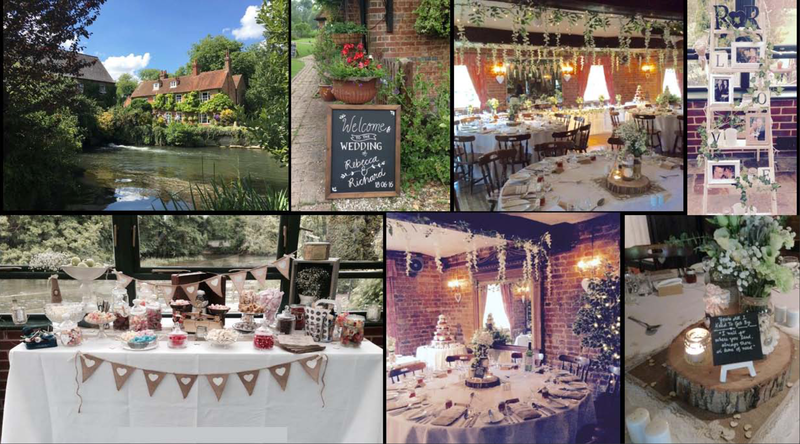 The couple wanted us to transform the Old Mill in Aldermaston (above and below) into a magical, intimate evening for their guests. 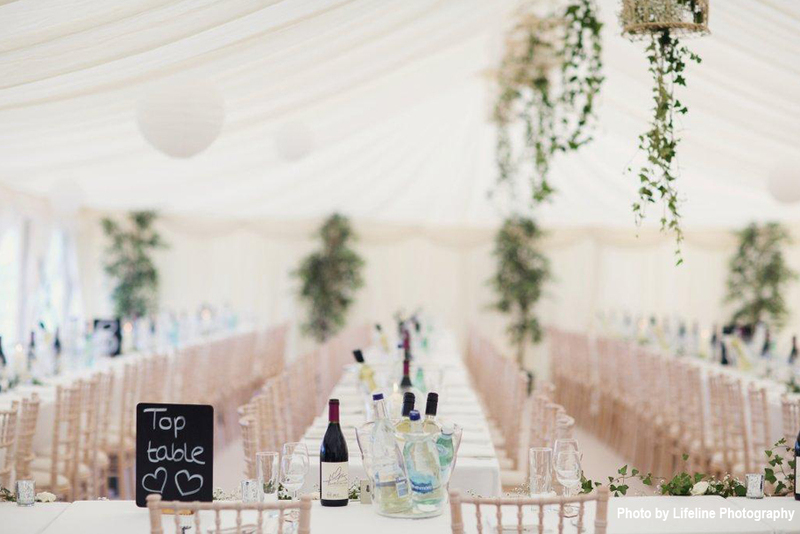 The result was stunning with greenery and wisteria dripping from the beams; log slices, hessian and gypsophila decorating the tables with little easle table names based on the couple’s favourite songs and twinkling candlelight in vintage glass votives finishing the look. 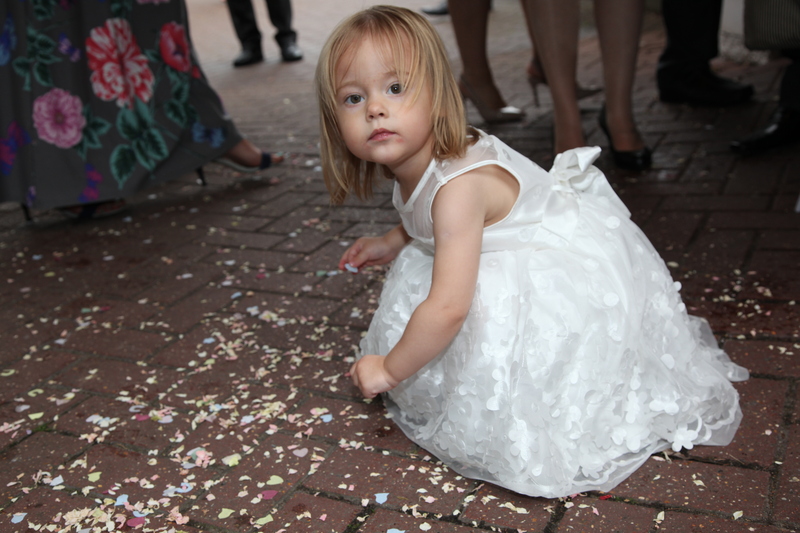 Sparkly fairy-lit evergreen trees lined the room with loads of hessian bunting and hearts dotted about. 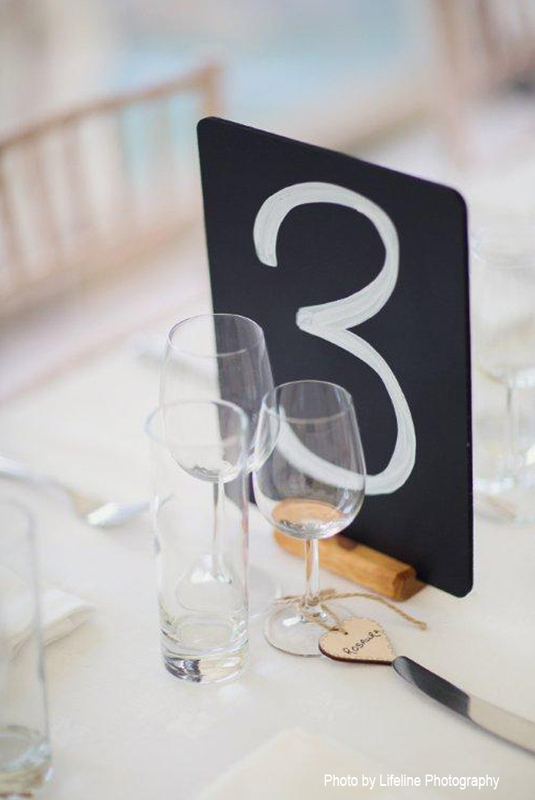 The couple asked us to show their love story in the way of their favourite photos on our vintage ladder and we created a huge sweet table to look like a vintage sweetshop complete with weighing scales and printed bags. 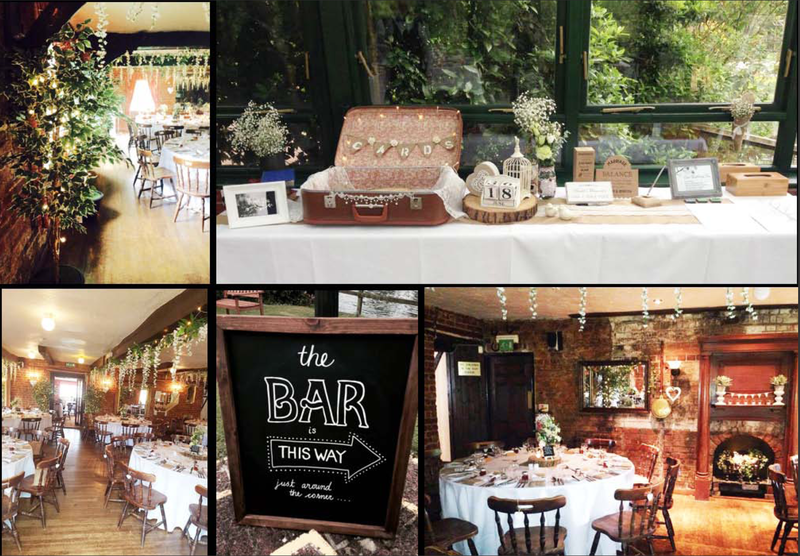 At the same wedding, we transformed a vintage suitcase with special memories for the bride into a gorgeous card card and added loads of other touches including potted plants to brighten up the tables and steps outside and little lanterns and flickering lights in all the nooks and crannies. 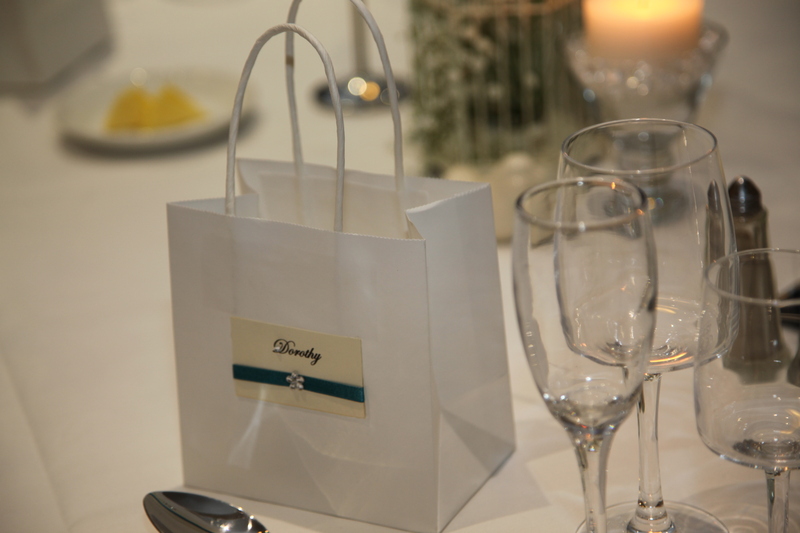 Being able to create exactly what the couple had envisaged was the best part of it all. 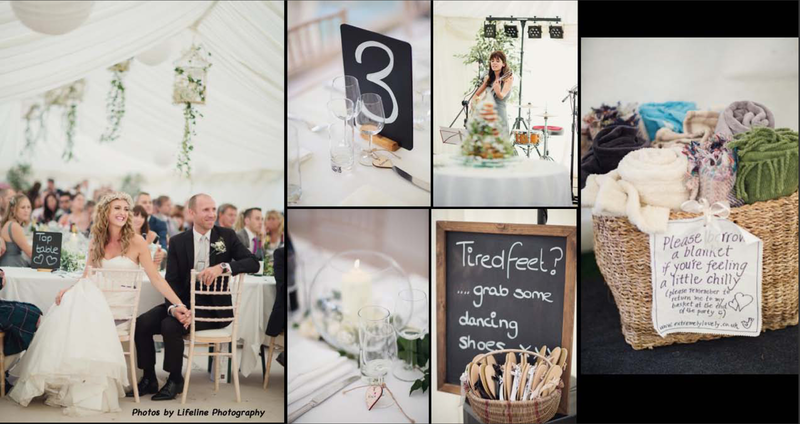 Beautifully captured by the talented Trevor and Jenny from TJ Photography. 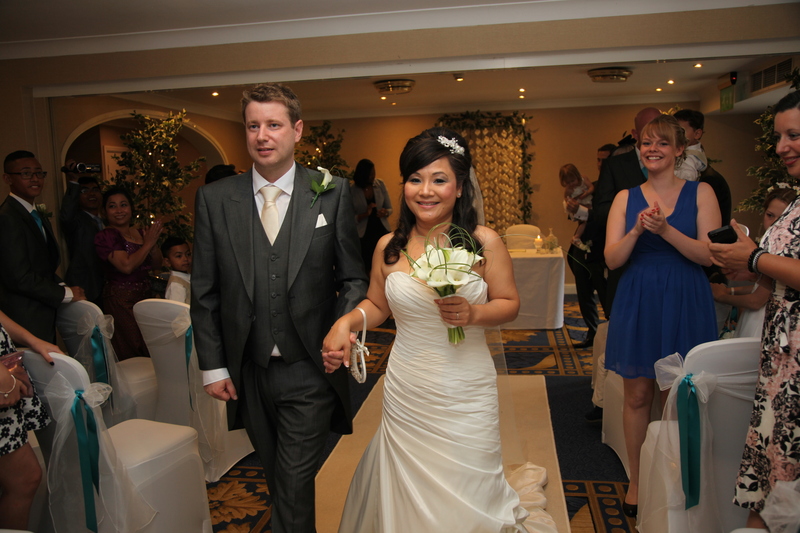 The Basingstoke Country Hotel’s Naseby Suite provided the backdrop for this elegant wedding (above and below) which blended two families from opposite sides of the world toegther. 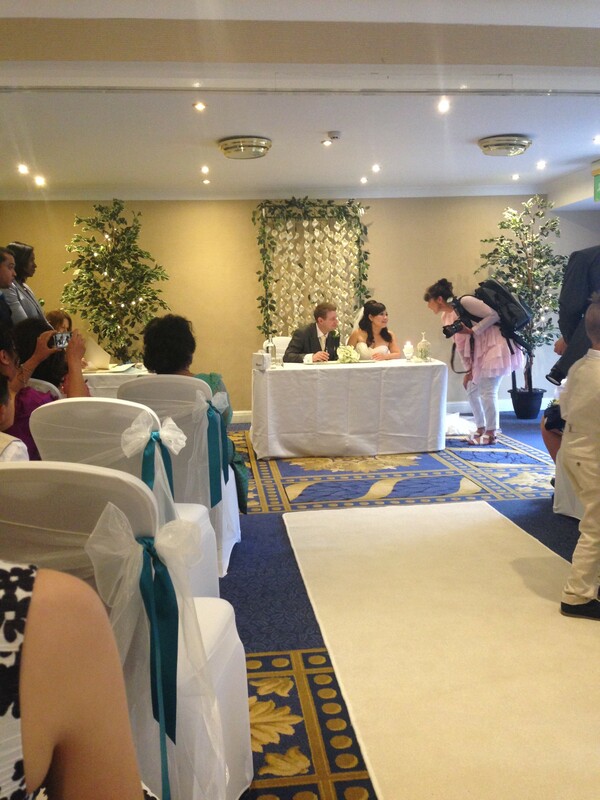 Our deluxe ivory carpet complemented the off-white chair covers with just a touch of the bride’s favourite colour. 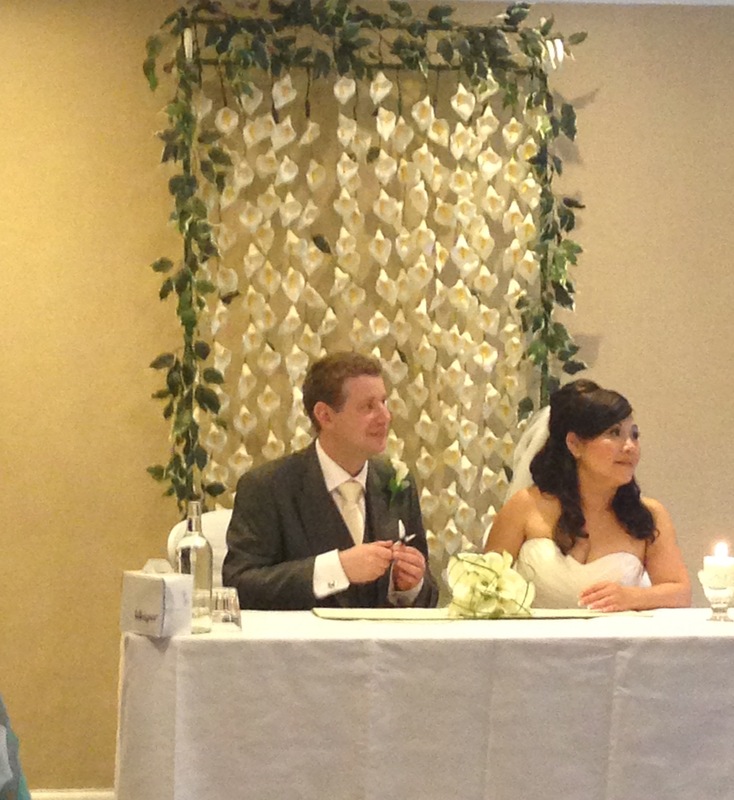 Our stunning lily and greenery backdrop added to the serene feel and was used first as a backdrop to the ceremony then moved to the reception area as a backdrop to the top table. 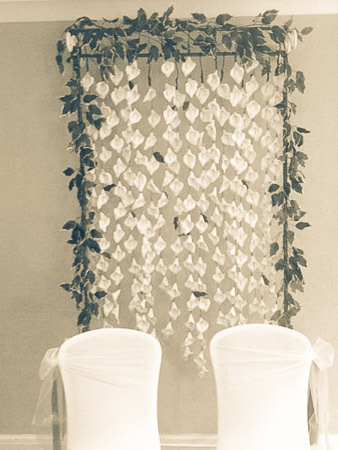 Fairy-lit evergreen trees lined the walls of the whole venue to distract from the corporate hotel look. 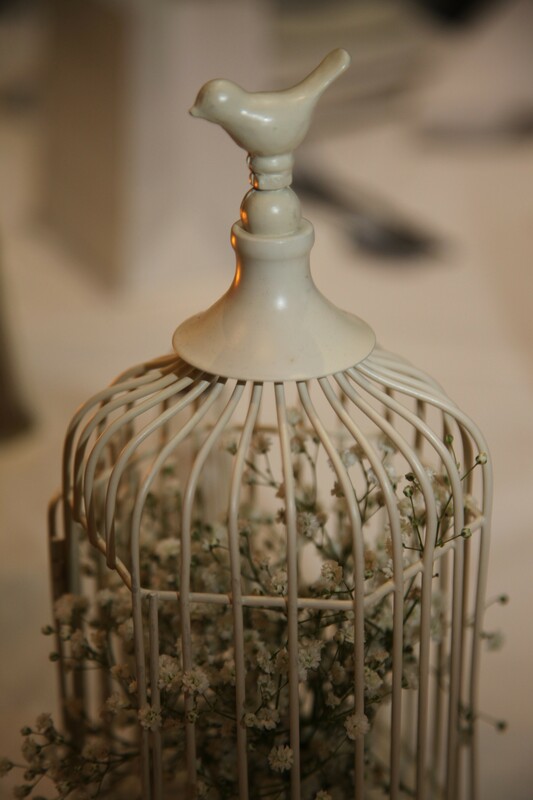 Bird cages filled with gypsophila continued the white and ivory theme with little bits of bling appearing on the handmade favour bags which doubled up as place cards. 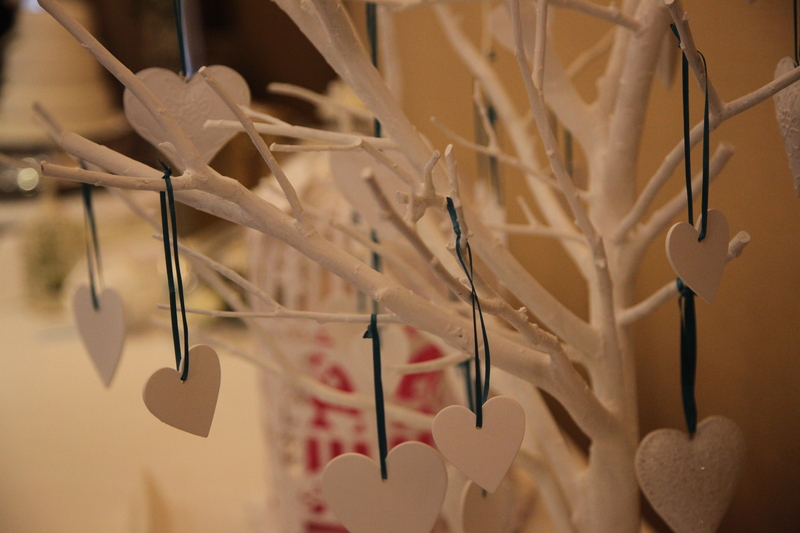 A wishing tree handmade by the groom’s clever father was decorated with little wooden hearts with lots of twinkly lights and lanterns added sparkle to the evening. 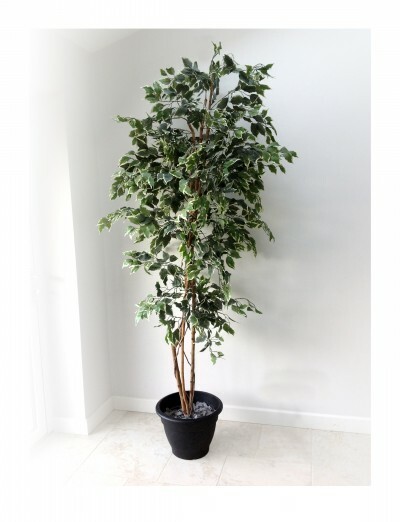 A very sophisticated look on a small budget. 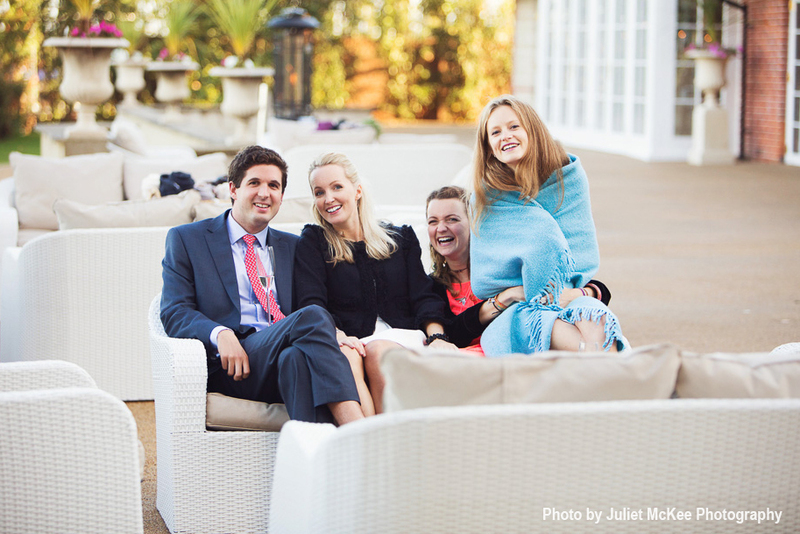 Photos courtesy of the lovely Kathryn Lacey. 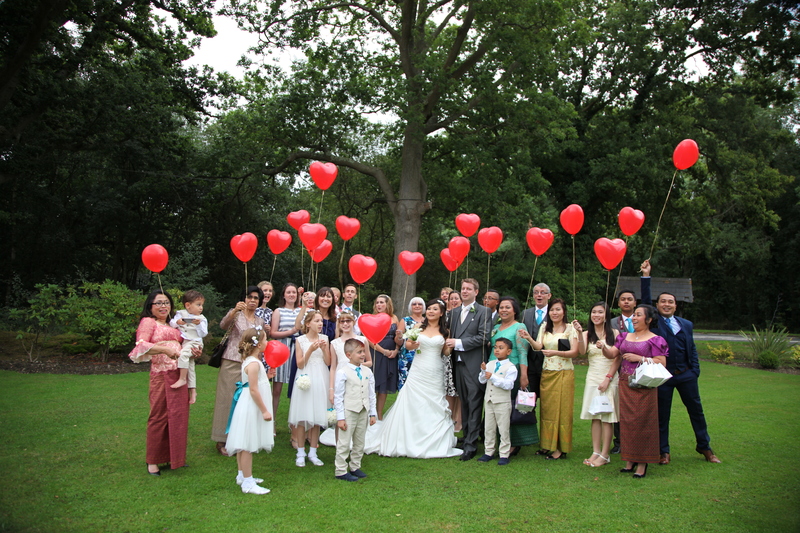 At the same wedding, our baskets of brollies, hired ‘just in case’, saved the day..well the wedding photos at least. 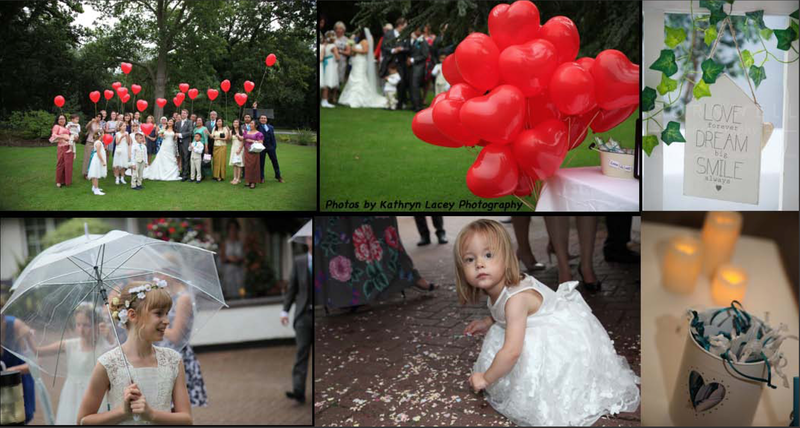 One of those gorgeous summer days when the clouds decided to shower us with love every time we tried to get photos outside! In the end they made for beautiful photos. 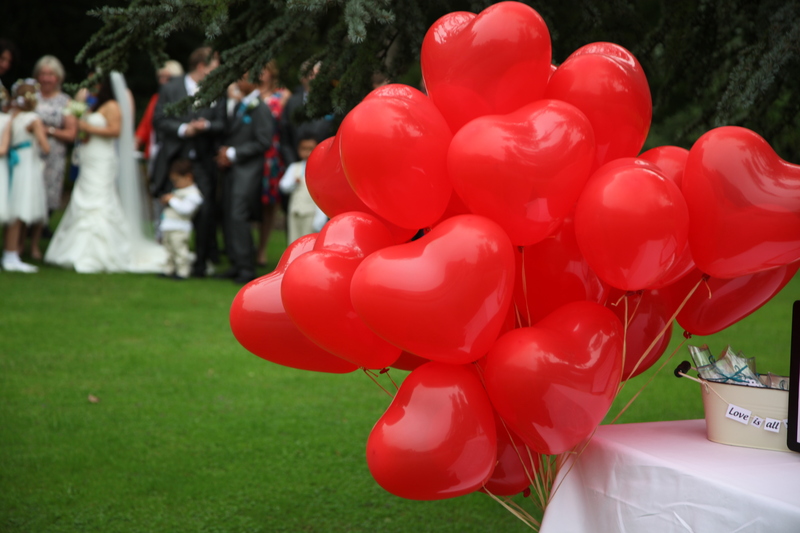 Our couple opted for our fun heart balloon release (with biodegradable balloons and strings) and tin trugs full of little packets of rose petal confetti. 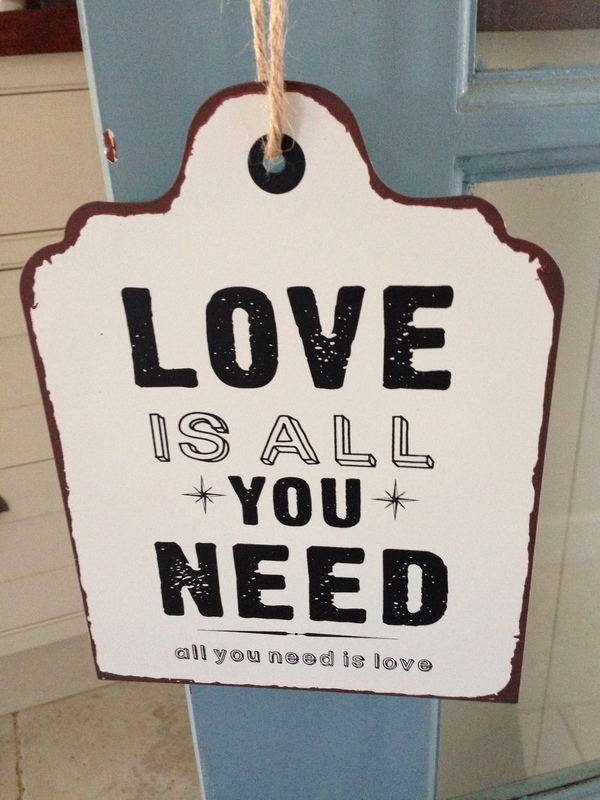 Little wooden signs and heart lanterns added the finishing touches. The gorgeous Froyle Park where we provided baskets of blankets to ward off the evening chill on a beautiful autumn day at Kate and Oli’s wedding. 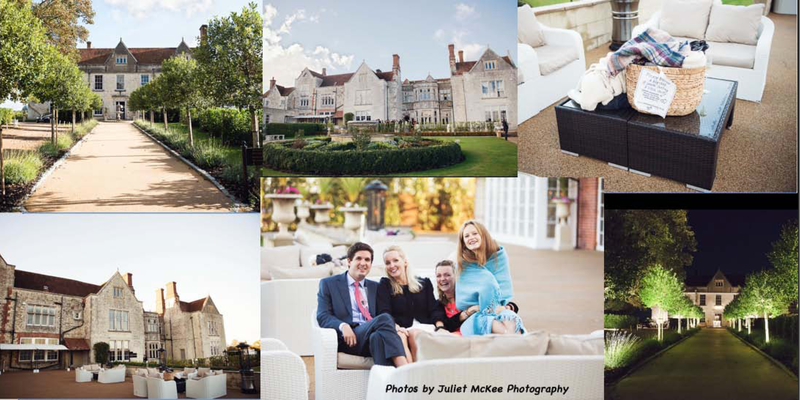 Photographs courtesy of Juliet McKee Photography. 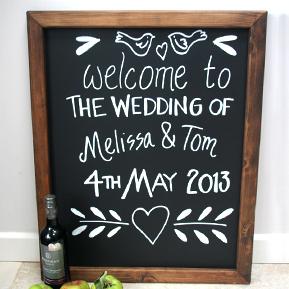 A very special wedding reflecting the couple’s personality perfectly, as seen on the Whimsical Wonderland Wedding blog. 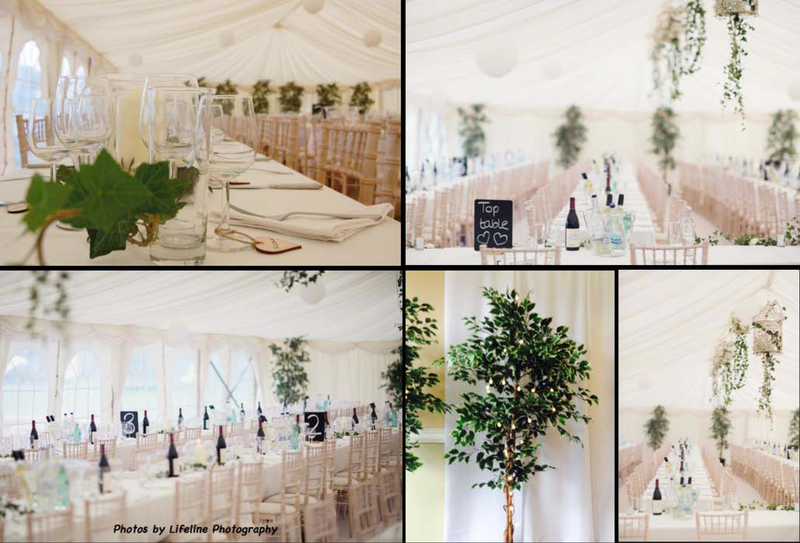 Again our fairy-lit evergreens transformed the marquee with gorgeous glassware, birdcages and loads of greenery. 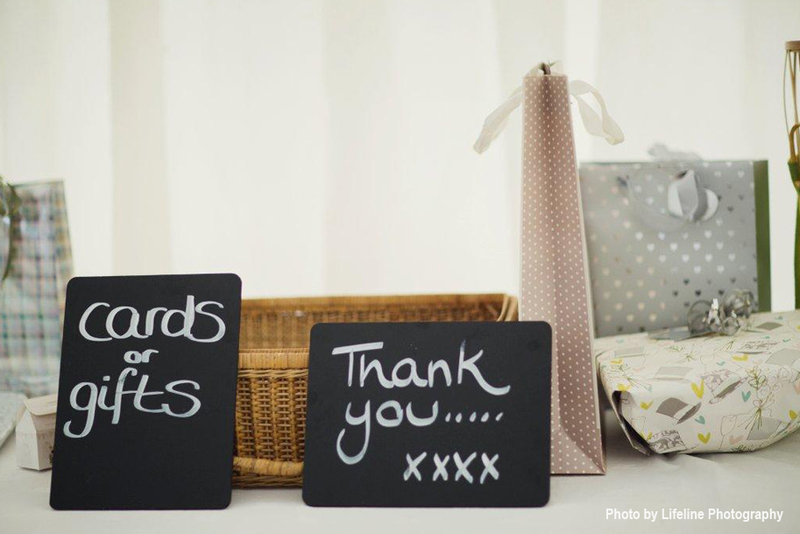 Chalkboards were used for table numbers and signs and baskets of blankets kept the guests warm as they nestled on haybales outside on a lovely summer evening at Ripley Cricket Club. 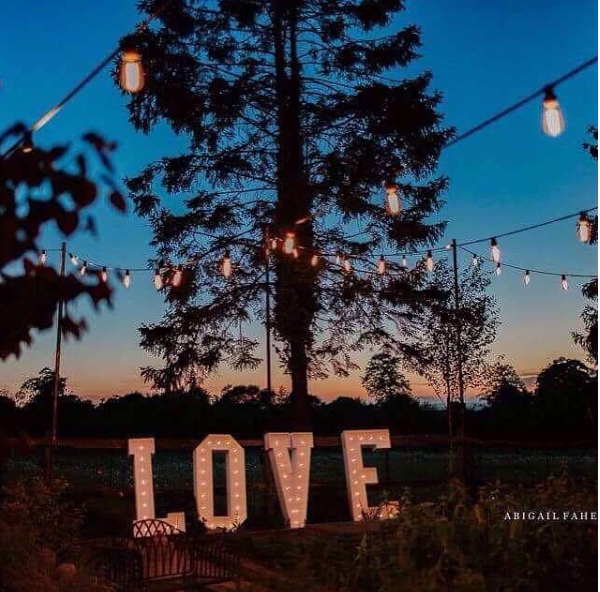 A wedding full of love and laughter without breaking the bank. 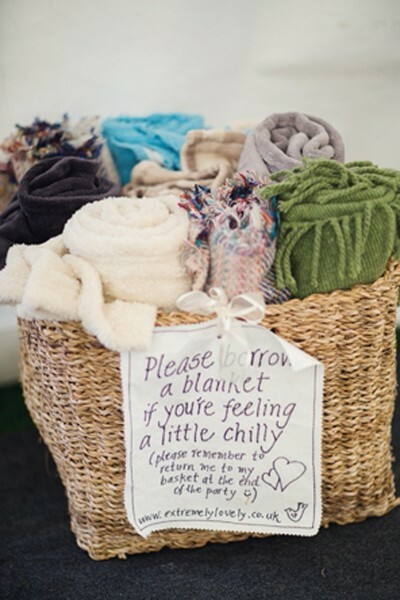 extremely lovely blankets at Kate and Oli’s Wedding, Froyle Park. Click Here to view our blankets.